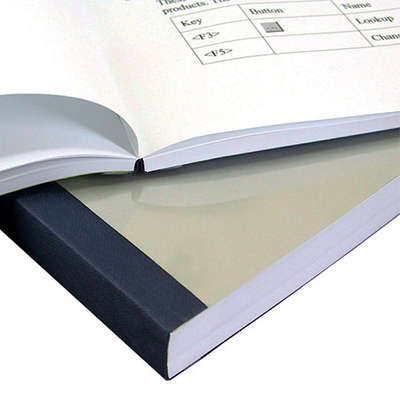 Tape Binding is a finishing option generally used for single use publications. Some types of publications that use Tape Binding as a finishing option are conference or training materials that won’t need to lay flat for reference purposes. Binding is usually used for break-out or training session literature in need of a little dressing up. Many cases the number of pages that will be contained within the publication dictates the type of finishing options that can be used. QPS offers a wide variety of finishing options to make sure your document will impress. Tape binding is usually published in small orders needed for conference and training sessions. Unlike coil or spiral binds, a tape finish is not the preferred choice for high reference literature or for note taking purposes. The process of tape binding places a cloth strip of adhesive tape along the bind edge of the document and wraps around the front and back covers.